Spanning nearly 170 miles in France, the Loire Valley alone contains more than 500 châteaux. Flourishing in the time of the Renaissance, the region was inhabited by the likes of Diane de Poitiers, controversial mistress of King Henry II of France, and famed Italian artist and inventor Leonardo da Vinci, making it historically interwoven with the great kings of France. Seeking to escape the pressures of Paris and enticed by the open lands and forests rich with game, the French kings made the Loire Valley their primary residence until 1589, when King Henry IV eventually moved his court back to Paris. Together, we will explore the Loire Valley through the eyes of the nobles who made the region their home. Over the course of our day trip from Paris to the beautiful Loire Valley, we will explore the elegant châteaux of the French aristocracy and discover the French Renaissance with an art historian. Explore three impressive Loire Valley châteaux, and learn their significance in French history. Loire Valley tour led by an art historian. Small, intimate group experience—never more than 6 on a tour. Meeting our docent at the station in Paris, we will take the train to Tours, a charming city nestled between Orléans and the Atlantic coast. Using our time on the train to gain some valuable insight into the Loire Valley of the Renaissance, we will arrive to join our driver at the train station buoyed by our newfound context on the picturesque region's history. Called the "Garden of France," the region is characterized by its central river—the longest in France, vineyards (a subject of interest for anyone who has taken our Paris Wine Tour and Tasting), asparagus fields, and the stunning châteaux that lure tourists away from France's bustling capital. We'll turn our attention towards the châteaux, which are not only impressive and beautiful architectural feats but serve as a great tool to understanding the the area's rich history. While our route may vary depending on private bookings, we typically start with Château de Langeais. This château embodies the social and cultural turning point, marking the moment where the Loire turned from a medieval territory dotted with defensive fortresses, to the epicenter of the French Renaissance with artisans, intellectuals, and ideas imported from Italy. After the initial structure was destroyed during the Hundred Year's War, King Louis XI altered the original building plan to reflect Italy's new architectural ideals—with a French twist, of course. However, Château de Langeais maintains much of its defensive structure, which can be best seen in its dominant towers, blank, machicolation (covered parapet with openings for soldiers to fire upon enemies), and drawbridge entry. Observing this first hybrid between Renaissance architecture and the fortresses of the medieval age forms the foundation for understanding the significant shift. We will then head to either the ethereal Château d'Azay-le-Rideauor Château de Chenonceau, both of which demonstrate an influence from the French and Italian styles. These graceful residences exemplify how French architecture began to distance itself from fortified structures like Château de Langeais. After being razed to the ground during the Hundred Year's War, Azay-le-Rideau was reconstructed in an unusual L-shape plan by the King's Treasurer General Gilles Berthelot. Similarly, the Château de Chenonceau's beauty is tempered with its connection to scandal between Diane de Poitiers and Catherine de Mecidi. Mainly redone by Poiters, King Henry II's mistress, the château featured the new Renaissance style, characterized by the appearance of carved façades, dormer windows set into the slate roof, and the introduction of a straight staircase, rather than the defensive spiral. We may spend time discussing the rivalry between Catherine and Diane, which came to a head following the King's death. We will also be able to see both Diane's gardens, and Catherine's later addition dating from her time as primary resident of the château. After a break for lunch, we will head west to Château de Chambord, the celebrated castle that is considered a true chef d’oeuvre of the French Renaissance. Originally built as the hunting lodge, this château perfectly demonstrates the marriage between medieval French style (perhaps best seen on our Paris Cathedral Tour) and classical Renaissance form. This architectural feat may be accredited to the project’s several undocumented architects, possibly including da Vinci himself. Passed through the hands of countless kings, dukes, and emperors, we will delve into the triumphant and torrid history of this castle. We will also note the discernible difference between Chambord and Langeais. While the layout is similar to a defensive fortress, with its towers and walls surrounding a keep, Château de Chambord was never intended to act as a defensive structure. Its innovations extend to the interior, which features a double helix staircase that may have been designed by Leonardo Da Vinci. Each château provides unique insight into the chronological evolution and historical significance of this region. Together, we will reflect upon the architectural elements that characterized the French Renaissance style. Over the course of our walk, we will have seen three excellent examples of royal residences from this period, and will have learned to identify the difference between medieval fortresses and the châteaux of the Renaissance. As our walk comes to a close, we will board the train, traveling from Blois to Paris, leaving the rich beauty of the Loire Valley behind us. The largest of the Loire castles, the turreted Chambord Castle was built for King Francois 1st as a hunting lodge. The intricate stone "double helix" staircase leading up to the spires and turrets of the rooftop terrace is thought to have been designed by Leonardo da Vinci. Cheverny Castle is the most beautifully furnished of the Loire Valley castles, with a fine collection of 17th-century furniture. Herge, the Belgian creator of Tintin, based his Marlinspike Hall (Moulinsart) on Cheverny Castle. Chenonceau Chateau was built over the River Cher in traditional Renaissance style, and is known as the Chateau des Dames (the Ladies' Castle) because of the influence of the famous women who lived there. The chateau was built in 1513 by Catherine Briconnet, embellished by Diance de Poitiers and Catherine de Medicis, and saved from destruction during the Revolution by Madame Dupin. Please note: On Mondays and Saturdays, the tour will visit Amboise instead of Cheverny. The day dedicated to "Renaissance" starts with a visit of Amboise Castle, where King Francis 1st welcomed Leonardo Da Vinci at the end of his life. After lunch (included), you leave for Chenonceau Castle and the day finishes with a visit of Chambord. Discover Château dAmboise, a favored royal residence during the Renaissance. Here, in the Chapel of St Hubert, the remains of Leonardo da Vinci are buried. After a visit of the Chateau, enjoy lunch with drinks (included). At the beginning of the afternoon, there is a visit to Chenonceau Castle, called the "Chateau aux Dames" built on the Cher. Finally, you will visit the impressive Chambord Castle before returning to Paris. Enjoy a full day exploring magnificent castles in the Loire Valley, a UNESCO World Heritage-listed region in central France. After pickup from your hotel in Paris, your guide will take you to the picturesque Loire Valley to independently discover three different châteaux; Amboise, Chenonceau and Chambord. This small-group tour is limited to 16 people, ensuring youll receive a more personalized experience. After pickup from your central Paris hotel in an air-conditioned minivan, relax on the scenic drive to the Loire Valley, a UNESCO World Heritage-listed wine region in central France. You will have the chance to independently discover three different châteaux. First, discover Château dAmboise, a favored royal residence during the Renaissance. Here, in the Chapel of St Hubert, the remains of Leonardo da Vinci are buried. Then, marvel at Château de Chenonceau. Famed for its highly decorated interior and exterior, this is one of the most popular châteaux in France. After your tour, enjoy a three-course lunch with wine (included) at the nearby 18th-century Breton-style inn (for a sample menu, please refer to the Itinerary section below). After lunch, visit UNESCO World Heritage-listed Château de Chambord, the largest castle in the Loire Valley and one of the most recognizable due to its astounding Renaissance architecture. Legend has it that Leonardo da Vinci contributed to the design of its famous double-helix staircase. After your Loire Valley châteaux tour, enjoy a relaxing drive back to Paris. On this private day trip from Paris, visit three castles in the Loire Valley, a scenic region known for its wine and stunning French châteaux. With a private guide, you'll learn about the lifestyle, art, architecture, and politics of the historical period when French kings held court in the Loire Valley. The tour takes you to three of the region's most significant castles: Château de Chenonceau, Château d'Amboise, and Château de Chambord. Your day trip to the Loire Valley begins with pickup at your Paris hotel by your private guide. Head out of the city and into the picturesque countryside to visit romantic castles that evoke the glamour and grandeur of French aristocracy in the Renaissance era. Follow in the footsteps of nobility as you explore three estates known for their size, architecture, and previous inhabitants. At Château d'Amboise, once home to French royalty, take in the 15th-century furniture collection. Then visit Château de Chenonceau, a lavish castle on the River Cher featuring quintessential Renaissance architecture. Finally visit the grand dame, Château de Chambord, a UNESCO World Heritage site once home to King Francois I, as well as Leonardo da Vinci. Note: It is possible you may visit different castles such as Château de Blois or Château de Cheverny, in certain circumstances, but it will be a total of three. Choose a sunrise or sunset balloon flight, then hop into your 4x4 vehicle at your Amboise hotel for the journey to the launch site. On arrival, watch your balloon being inflated and listen to a safety briefing from your pilot. With your balloon ready for flight, jump into your basket and take to the skies! During your 3-hour flight, watch the sun rise or set over the forests, lakes, rivers, and towns of the Loire Valley. Capture birds eye views of the vineyards and orchards, and listen as your pilot points out famous landmarks such as the castles of Amboise, Chenonceau, or Villandry. Enjoy a smooth touchdown, then toast your flight with a glass of bubbling Champagne or sparkling grape juice. Receive your flight certificate, then return in comfort to your hotel to conclude your tour. Enjoy a private tour of the two most popular castles in the Loire Valley with a registrered guide. Discover chateau de Chenonceau, its graceful architecture and remarkable gardens. Tour Chambord, the largest and most spectacular Loire Valley castle. Private excursion, chauffeur guide and vehicle from 09:30AM to 05:30PM. Our recommendation for the train if you come from Paris: TGV n°8407 - departure from Paris Montparnasse train station at 07h40 and arrival at Saint Pierre des Corps train station at 08:45AM. The unique architecture of the Chateau makes it one of the most exquisite Chateaux in the Loire Valley. Nicknamed the ladies castle », Chenonceau is related to important French women such as Catherine de Medici. The magnificent Renaissance gardens around it make it even more spectacular. Float effortlessly through the skies in France and admire sweeping views over the Loire Valley on this 3-hour hot-air balloon ride. After helping your pilot inflate the hot-air balloon, step into the basket and drift high over the Loire Valley. Admire sweeping views over the scenery below, then toast your flight with a glass of Champagne on landing. 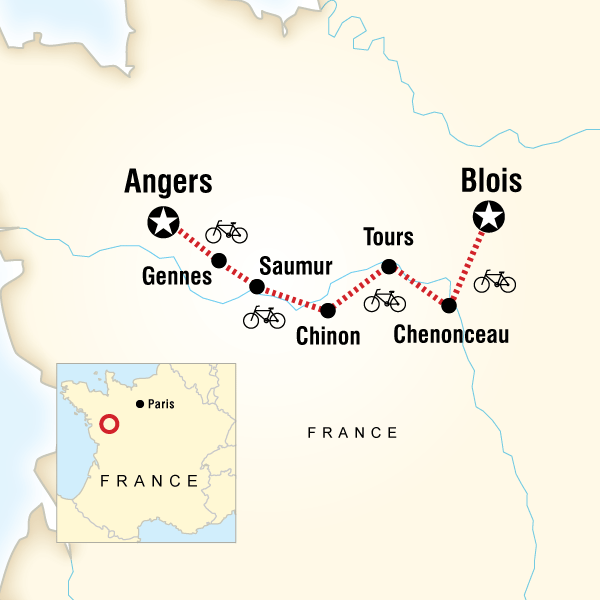 Tour includes round-trip travel from Francueil, near Chenonceau. After perhaps helping to prepare your hot-air balloon, climb into the basket in the village of Francueil  near Chenonceau  between 6am and 7am (for the morning flight) or between 7pm and 8pm (for the evening flight). Then, watch as your pilot ignites the burners to send you into the wide, blue yonder. During your 1-hour flight, listen as your pilot points out the forests, lakes, rivers, and towns of the Loire Valley. Enjoy the peace and quiet hot-air ballooning offers, and capture the spectacular scenery on camera from your vantage point in the sky. On landing, enjoy light refreshments accompanied by a flute of Champagne to toast your flight, then transfer back to your starting point to conclude your tour. A Loire Valley Château VIP balloon flight for just two in your own private basket with pilot of course. Float effortlessly through the skies in France and admire sweeping views over the Loire Valley on this 3-hour hot-air balloon ride. After watching your pilot inflate the hot-air balloon, step into the basket and drift high over the Loire Valley. Admire sweeping views over the scenery below, then toast your flight with a glass of Champagne on landing. Tour includes round-trip travel from Francueil, near Chenonceau. These private flights are scheduled every day except saturdays. Rendezvous time with your pilote is either at 06h00 am or 07h00 pm. The total excursion time is 3 hours. Your pilot and crew will meet you at the rendezvous point at the winery La Gourmandière in the village of Francueil (near the Chateau of Chenonceau - Loire Valley) They will drive you to the take off field near the Chateau where you will watch the inflation, climb on board and off you go for a one hour flight past the Château and over the French countryside. After discovering Chateau and villages along the way at the gentle landing your pilot will serve a bottle of local sparkling wine. Once the balloon is packed up he will take you back to the rendezvous point by car. Travel out of Paris to the picturesque Loire Valley by deluxe car or minivan on this private day trip. You'll visit three of the major castles in this UNESCO World Heritagelisted region: Château de Chambord, Château de Chenonceau, and Château de Cheverny (or Château d'Amboise or Château de Blois if you choose, instead of Cheverny). Tour the inside of the three castles with a private guide, who shares insight about the architecture and history. Hotel pickup and drop-off are included. Your day trip starts with hotel pickup by private vehicle for the 2-hour drive from Paris to the Loire Valley, known for its castles and wine. Start with a visit to Château de Chambord, the largest in the Loire Valley, allegedly built using a design created by Leonardo da Vinci. This extravagant structure with 360 chimneys once housed members of the French court, who would welcome the king of France when he returned from hunting. Of all the architectural wonders of Chambord, the most famous is the double-spiral staircase, the core of the building. Next, discover Château d'Amboise, a royal castle and gardens overlooking the Loire River and the blue-slate roofs of the town of the same name. The St. Hubert chapel is home to the tomb of Leonardo da Vinci, who died while a guest of the king. If you wish, you might want to enjoy a tasting of Touraine wines, from the appellation of Amboise or Montlouis (own expense). Then continue to Château de Chenonceau, known for its construction over the Cher River, where the beauty of its architecture is reflected in the water. Nicknamed the 'Château of the Ladies,' Chenonceau was a favorite among women of the French nobility. Your private day trip then ends with return to your Paris hotel. Note: On the day of your tour, it may be possible to visit a different castle instead of Amboise, to be discussed with your guide, such as Château de Cheverny, an early 17th-century private castle, richly furnished, with a beautiful park and a hundred hound dogs in their kennels. Or visit Château de Blois, a royal castle that illustrates different periods in architecture with its combination of Gothic, Renaissance, and Classical styles. See majestic Loire Valley castles on a full-day private tour from Paris! With a whole day to spend in the UNESCO World Heritage-listed Loire Valley region with a local guide, youll see the best of the many castles that make region famous. Choose between two sets of châteaux  Amboise, Chenonceau and Chambord or Villandry, Langeais and Azay le Rideau  and enjoy lunch at an 18th-century inn or the park of Château de Langeais. After pickup from your central Paris hotel in an air-conditioned minivan, relax on the scenic drive to the Loire Valley in central France. Below are the two sets of castles you can choose to visit on your private tour. With your private guide, explore Château dAmboise in the heart of the beautiful Touraine region. Learn about this fascinating Gothic-Renaissance castle that was favored by French kings, and visit the Chapel of St Hubert, where the famous Renaissance painter Leonardo da Vinci is buried. Your tour continues to Château de Chenonceau, noted for its elegant regal décor that has no doubt helped to make it one of the most popular French châteaux. After touring the castle, sit down for a hearty three-course lunch at an 18th-century inn nearby (included). Refer to the Itinerary section below to see a sample menu. Your day finishes at the largest of the Loire Valley castles -- Château de Chambord. This ornate Renaissance castle is on the UNESCO World Heritage list, and rightly so! As you tour this extravagant castle with your private guide, marvel at its architecture and see its intriguing double-helix staircase that was reputedly designed by Leonardo da Vinci. Start your private tour with a visit to Château de Villandry, the last castle to be built on the Loire River. While its inside is interesting to see, the main draw of this gorgeous château is undoubtedly its lavish gardens. Stroll along the tranquil terraces and immaculate lawns, and prepare to get lost in its puzzling maze! Head onto Château de Langeais and admire its classic medieval architecture as you explore inside. Learn about the rich history surrounding this fascinating, yet somewhat imposing, fortress that was once the most important stronghold along the road to Nantes. For lunch, visit the bakery near the castle (own expense) and settle down for a picnic in the castles peaceful park. Alternatively, your guide will happily offer recommendations for nearby restaurants and cafés if youd rather eat somewhere else. Lastly, tour the UNESCO World Heritage-listed Château dAzay le Rideau, easily one of the most elegant castles in the Loire Valley. This gorgeous chateau lies on a tiny island in the middle of the River Indre, surrounded by wooded parkland. After your Loire Valley châteaux tour, enjoy the relaxing drive back to Paris. Explore the beautiful Loire Valley vineyards of the Vouvray Appellation. Visit two superb estates, meet the producers and learn how to taste these elegant wines from this well-known terroir of the Loire Valley area. Don't forget to enjoy stunning views of the town of Amboise and its impressive chateau! 2.00pm: Meet your guide at Tours Toursit Office, step into a minivan and then you're off to Vouvray. Discover this beautiful wine area full of passion-driven winegrowers. Meet a French winemaker in a charming family-run estate. See the vines and visit the traditional vat room and the cellars. During this visit, you will improve your knowledge regarding wine-making and of course wine-tasting. The terroir of this wine area allows the production of elegant sparkling wines and white wines. After this first visit, explore one of the famous underground caves that were dug at the 10th century in order to extract stones, and today used by a famous Loire Valley Wine house for producing and storing wines. All along the afternoon, your passionate guide will share with you all his knowledge to help you understand better the diversity of Loire wines and its specific terroir. You will learn the different steps of wine-tasting and train your nose to identify many wine aromas. To do so, you will aslo taste wines from the other Appellations of the region. Benefit from your guide's tips and tricks and taste like a pro. After this experience, the Loire wine-area will have no secrets left for you. Before saying goodbye, share an aperitif made of local products like cheese, rillettes and fresh bread - the perfect match to Loire wines with a stunning view. 7.00pm: Return to Tours Tourist Office. In this full day private tour from the town of Tours, discover the French kings valley at Christmas time! The Renaissance castles hosted magnificent receptions in the old days, this tradition and art of entertaining in the Loire Valley is still alive nowadays. December is the perfect time to embrace the castles beautiful holiday decor and enjoy the special atmosphere of Christmas and New Year celebrations. Your guide will pick you up at 9am from your hotel or accommodation in the town of Tours. Board your comfortable private minivan and go to your first stop: Château de Chambord. More than just a castle, this work of art is a glorious historical site that will take you to the heart of the Loire Valley. Upon entering the park, you will discover majestic 3 meter-high Christmas trees lighting up the alleys. If the weather is fine, your group will share a coffee, hot chocolate or croissants in the park, while taking in this truly unforgettable view! Once inside this must-see castle, your visit will be animated with wonderful decorations, cozy fireplaces and splendid Christmas trees. This tour will be made even more fun and captivating by your personal guide. He/She will select for you the most emblematic rooms to visit, share memorable anecdotes and point to hidden details of interest. Prepare yourself for some breathtaking views of the castle and life in time of French Renaissance. After this first visit, you will need a small rest! Your guide will drive you to Château de Cheverny for a cozy lunch (not included in the price of the tour - to be paid the day of the tour) by the fireplace. The atmosphere of the Trophee hall is quite unique. The candle-lit table is prepared for a wonderful lunch served with wine produced in the area. Kids and adults alike will definitely enjoy this French "art de vivre". Yet, the day is not over! Continue to Chenonceau village. Château de Chenoceau is one of the most visited historical monuments in France. You will have the chance to admire this unique castle built on a bridge crossing the Cher river. With your guide, take your time to appreciate the refined fresh flower arrangements for which the castle is renowned, impressive gilded Christmas trees in each room, and striking garlands everywhere you look - even in the castles kitchen! Come nightfall, a stunning view of the the castle illuminations will be unveiled before your eyes. Lit up by a myriad of colours, the Ladies castle suddenly takes on a magical atmosphere. Then, your guide will drive you back to the city of Tours at around 7pm. Allow USD295-385 for meals not included. In the afternoon cycle through some of the Loire's tiny villages on the way to Gennes. Stop for a visit to the Pierre et Lumiére museum. Discover some of the most picturesque villages on this 2-day Loire Valley Castles tour from Paris. Leave the city behind you and travel into rural France with your guide. Visit famous French castles such as Château de Chenonceau, Château de Cheverny and Château de Chambord. Explore the Château du Clos Lucé, Leonado da Vincis final place of residence in the 16th-century. Admire the castles spectacular architecture and ornate interiors, and learn of their fascinating histories from your guide. Depart from central Paris by air-conditioned coach and head through the Aquitaine countryside to the town of Blois in the Loire Valley, where the Royal Château de Blois awaits. Tour the beautiful castle with your guide and learn of the many French kings who once called it home. Enjoy free time in Amboise for lunch, then discover the spectacular Château du Clos Lucé, famous as the final residence of painter and inventor Leonardo da Vinci in the 16th century. Head on to explore the beautifully manicured Gardens of Villandry with your guide. On the second day of your tour, enjoy guided tours of Chenonceau, Cheverney and Chambord  three of the Loire Valleys finest castles. Marvel at the blends of architectural styles you see and admire the fine arches of the Château de Chenonceau stretching across the Cher River. At the end of your castle visits, travel back to Paris by coach where your tour will conclude. Visit three different corners of France and discover some of the countrys most beautiful landmarks on this 3-day tour of Normandy, Saint-Malo, Mont Saint-Michel and the Loire Valley. Explore Rouens ancient Old Town and the delightful coastal town of Honfleur. Visit Omaha Beach and learn of the World War II Normandy landings. Visit Saint-Malo and the UNESCO World Heritage site of Mont Saint-Michel with your guide. Tour fine medieval châteaux in the Loire Valley, including the famous Château de Langeais. Accommodation in 3-star hotels and most meals included. Begin with a visit to the delightful town of Rouen and explore the medieval Old Town with your guide, then head onward to the beautiful port of Honfleur. Discover the famous Omaha Beach  site of the Normandy landings in WWII  and visit the American Cemetery of Saint-Laurent and Arromanches. Take a guided tour of Saint-Malo then continue on to the UNESCO World Heritage site of Mont Saint-Michel and visit the ancient abbey. Head deep into the French countryside and marvel at the plush interior and stately beauty of the medieval Château de Langeais. Conclude your tour in the Loire Valley with a tour of the Château de Chambord  widely considered one of the finest châteaux in France  then travel back to Paris where your tour will come to an end. Explore Normandy and the châteaux of Frances Loire Valley on this 3-day tour from Paris. Visit famous Mont St-Michel and tour the Abbey with your guide. Travel deep into the château country of the Loire Valley and visit beautiful castles like Château de Chambord and the Château du Clos Lucé, where Leonardo da Vinci lived. Hear of the history and heritage of these spectacular mansions during your tours. This easy excursion from Paris is a wonderful way to see more of France. Overnight accommodation and comfortable coach transport are included. Depart Paris and head through the Normandy countryside to the historic Mont St-Michel. Enjoy a guided tour of the interior of the Abbey, then explore the streets and alleyways in your own free time and soak up the atmosphere at your leisure. Travel to Angers and take in views of the 9th-century Château d'Angers before continuing onward to tour the Château de Langeais and the Château du Clos Lucé. Wander the ground of the Château Villandry and admire the beautiful gardens there. End your day with a visit to the ancient town of Tours. Take a guided tour of Château de Chenonceau then travel on to Cheverny for lunch. End your tour with a guided visit of the Château de Chambord, widely considered to be the finest in the Loire Valley. A knowledgeable guide, round-trip coach transport and overnight accommodation are included, as well as some meals. Discover the regions of Normandy and the Loire Valley on this 2-day tour from Paris. Visit iconic Mont St-Michel and then venture through château country to visit several renowned castles like Château de Chenonceau and Château de Chambord. Your guide will reveal the history of these must-see regions and sights during your guided visits. If you have a short stay in France, this easy trip from Paris is a fantastic way to see more of this beautiful country. Overnight accommodation and comfortable coach transport is included. Take a guided tour of iconic Mont St-Michel in Normandy before venturing to central France to visit three remarkable Loire Valley châteaux: Château de Langeais, Château de Chenonceau and Château de Chambord. A knowledgeable guide, round-trip coach transport and overnight accommodation is included, as well as some meals.